Whether you’re looking for mountains to go rock climbing or deep water soloing, Oman has some awesome crags for both beginners and advanced climbers. If you’re up for a hike instead, you need to make your way to the top of Jebel Shams, the highest point in Oman! The views are incredible! insydo tip: Wadi Daykah in Muscat has multiple rock climbing crags for various levels of difficulties. In case you’re wondering – this is nothing like the Via Ferrata zip line atop Jebel Jais. The Via Ferrata in Oman is an incredible cave hiking & climbing adventure at the top of the Jabal Akhdar mountains – that’s 6,000 metres above sea level! This is not one for the faint-hearted, but an unforgettable experience nonetheless. 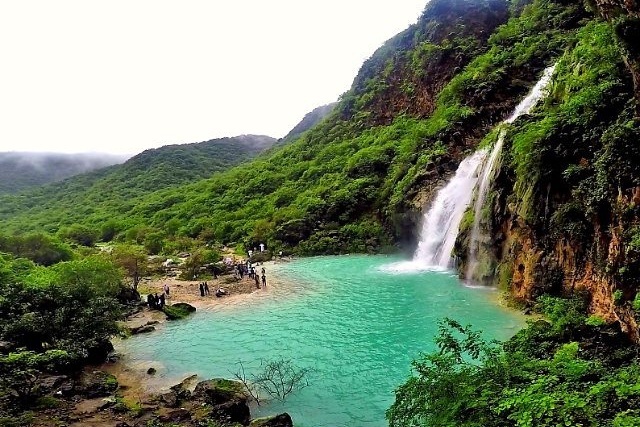 Ever visited Salalah? Known for its beaches, banana plantations, marine life and greenery, this sub-tropical city is filled with nature, and is home to some pretty cool waterfalls too! It’s a great place to visit for a quick weekend getaway. insydo tip: Make sure you check out Ayn Khor – definitely one to tick off the bucket lists. If you live for adventures, you definitely need to try this! Oman is home to a lot of wadis and mountain areas, which are perfect locations for canyoning! What’s canyoning? It’s a fun outdoor adventure where you must walk, scramble, jump, climb, abseil or even swim through canyons! Wadi Ash Shab and Wadi Tiwi are great spots to check out. insydo tip: If you’d like to visit with a group and a tour guide, Adventurati Outdoor organises regular canyoning trips to Oman, as well as other activities in the region. previous7 Crazy Water Adventures To Tick Off Your Dubai Bucket List! next10 Free Things To Do in Dubai – In Every Area!